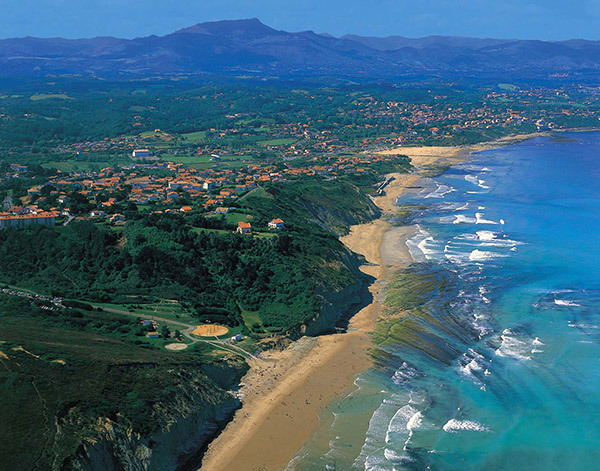 From Anglet to Hendaye, the Basque coast is intimately intertwined with the mountains. The first Pyrenees’s peaks seem to hesitate between the call from the ocean and of the highest peaks. To enjoy cliff path and mountains at once, do not hesitate to follow the coastline path, which will take you on an effortless 25 km long road along the Ocean, from Bidard to the Bidassoa estuary, with the mountains on one side, and cliffs and beaches on the other side. Set on the Basque coastline, a strange mansion built at the end of the XIXth century by the Baron of Espée can be seen. It is so impressive that the legend states that from its attic, on a clear day, one can see the Pic du Midi de Bigorre observatory, which stands over 150 kilometres as the crow flies! True or not, this story is beautiful and reveals the narrow relationship connecting the Basque coast to the mountains. From Anglet to Hendaye, anywhere from the Basque coastline, one’s eyes cannot help admiring this mountain set. Would Saint-Jean-de-Luz bay have so much charm without the benevolent attention of the Rhune’s peak that raises its 905 meters some 10 kilometres away from there ? When the weather is good, the Rhune’s peak offers a mind-blowing view of the Ocean, from Saint-Sébastian to the Landes coast. The famous GR10 walking trail starts there, on Hendaye Beach going across all the Pyrenees range. Although the Basque mountain is not very high, from Biriatou, the first footpath makes you realise that it‘s not necessarily gentle to climb and, going up the Ibardin Pass, your legs will soon realise what a sharp vertical drop really means. There is a close relationship between the coast and the mountain of the Basque country, as proved by the famous Coast of the Basques in Biarritz, named in memory of the inland’s Basques who used to come and relax there.